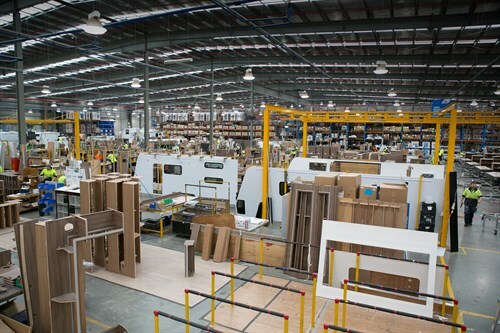 Nine completed caravans roll off the caravan production line at Jayco’s 20ha factory in Dandenong South, Victoria, every single day. It’s difficult to find the words to explain the monolith that is Jayco’s manufacturing operation. Numbers might help, the caravan production line includes: 145 staff, 35 stations, resulting in a caravan being completed every 45 minutes. Then consider the fact that Jayco also builds camper trailers, pop-tops motorhomes, fifth wheelers and even park cabins, and you start to appreciate the scale of the operation. 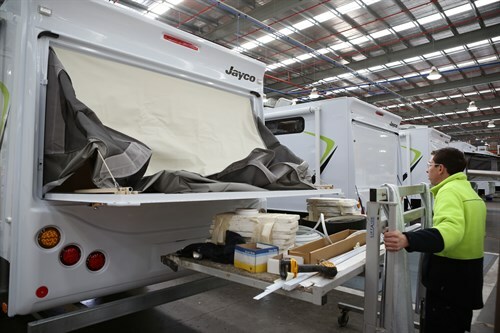 Jayco manufactures about 45 per cent of all new RVs sold in Australia, and it’s aiming to build about 10,000 caravans, campers and motorhomes this year. 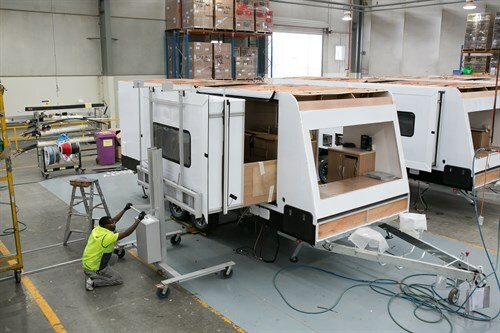 But, even knowing figures like that, it’s hard to comprehend the scale of Jayco’s operation, so we were keen to get behind the scenes and find out exactly how things work at Australia’s largest RV manufacturer. Jayco granted Caravan World exclusive access to the whole production facility to allow us to follow the build of a Jayco Expanda Outback caravan from start to finish, and to show you exactly how it’s done. For the purpose of this series, we looked at the Jayco Expanda Outback 21.64-1 – a 21ft full-height caravan with double front and rear fold-out tent beds, double bunks and an offside slide-out with club lounge. It’s the largest Expanda on offer. The Expanda comes in both pop-top and full caravan designs, with many layout variations for each. It’s somewhat of a hybrid between a caravan and a camper trailer, offering the more compact footprint and fold-out beds of a camper trailer and the comfortable living and storage space of a full-size caravan. 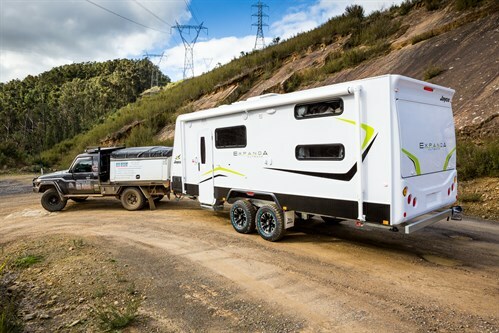 Jayco’s manufacturing operations manager Chris Ryan said the Expanda was designed for families that wanted to graduate from camper trailer travel to something a bit more comfortable. 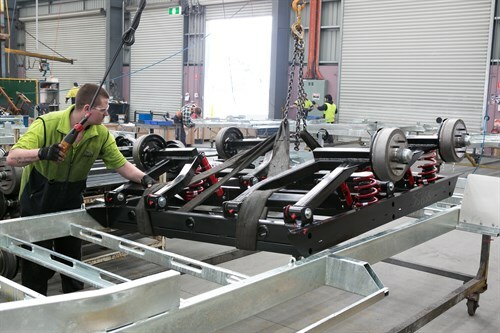 Jayco RVs start their life in the chassis shed where Jayco builds its hot-dipped galvanised 'Endurance’ chassis and fits its new JTECH independent coil spring suspension to all Outback models. Once the chassis is complete, it’s towed by a tractor over to the caravan production line. Housed in a massive warehouse, the production line comprises 35 individual stations which the caravans move along. Caravans are lined up at each station and are moved along the line every 45 minutes. Therefore, a finished caravan rolls off the line every 45 minutes. The speed at which these caravans are built is utterly staggering – even more so when you learn, as we did from caravan production line manager Matt Wallis, that Jayco has just increased caravan production and employed more staff. “We take off nine vans per day, which is about every 45 minutes. We put one on and we take one off,” Mr Wallis said. “On the line, we have 35 different stages and it takes roughly four days from start to finish from the moment it comes online to the moment we take it off. Once complete, gleaming and shining, the brand new van is towed off the production line and out the door, ready for shipping to one of Jayco’s 33 dealerships around Australia (29) and New Zealand (4). The full test appeared in Caravan World #531, November 2014. Subscribe today for the latest caravan reviews and news every month!